Arnout Colnot (1887) was a pupil at the workshop of Jan Maandag in Amsterdam, here he was educated in art. He did not learn the techniques in the workshop of Maandag, he mostly taught himself. Colnot was a painter, drawer, printmaker and lithographer. He moved to Bergen where he became a member of the Bergense school. 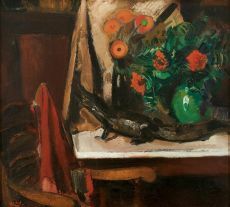 The Bergense school is known for their expressionistic style with cubistic... Read moreArnout Colnot (1887) was a pupil at the workshop of Jan Maandag in Amsterdam, here he was educated in art. He did not learn the techniques in the workshop of Maandag, he mostly taught himself. Colnot was a painter, drawer, printmaker and lithographer.